Public transportation is often thought of as a method of commuting between home and work, but play is just as important. It just so happens that St. Louis serves up quite the menu of transit-accessible entertainment – and dining options. St. Louis is well known for its restaurant scene with award-winning restaurants serving all types of food. It turns out some of those incredible dining experiences are located near MetroLink stations. To help you get from train to table, we’ve created a map of eating and drinking establishments within a quarter-mile of the MetroLink system. Map: Find a restaurant near a MetroLink station near you. While there are many great restaurants shown on this map, we wanted to highlight just a few that are very accessible … and delicious. In downtown St. Louis, there’s a delectable eatery that is literally situated on top of a MetroLink station. Sugarfire Smoke House BBQ at the MX opened its downtown location in 2016, and quickly attracted nearby office workers, visitors, and downtown residents to its door. The location sits on Washington Avenue, right above the Convention Center MetroLink Station, a few feet from its entrance. “We wanted Sugarfire at the MX to be a part of the urban fabric of the Mercantile Exchange District in downtown,” said Amos Harris, the developer of Mercantile Exchange and principal of real estate developer firm Spinnaker Real Estate Partners. Have you ever wondered why the Convention Center MetroLink Station smells so tantalizing? It’s no accident. Sugarfire’s smoker was placed outside on the street, with permission from Metro and others, and that sweet smell makes its way underground. 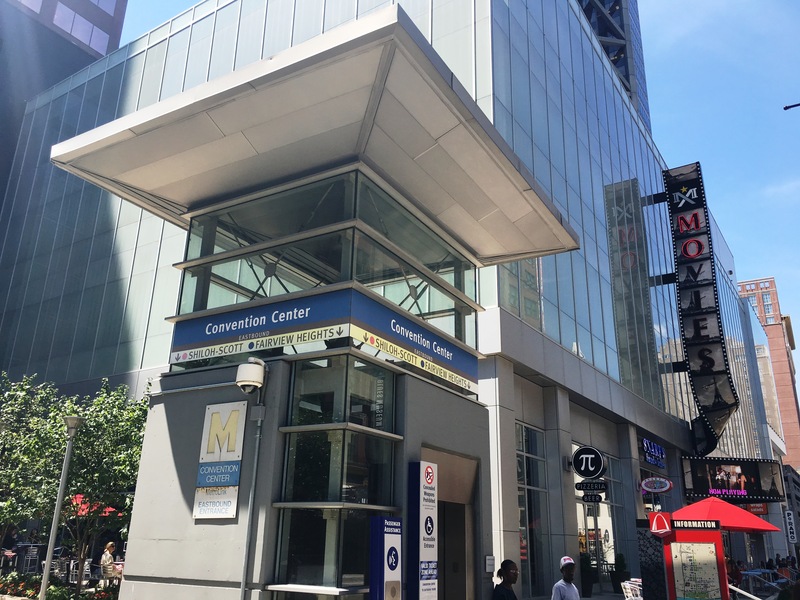 “People walking through the Convention Center MetroLink Station, as well as those on Washington Avenue, can now associate the station and the MX District with the smell of Sugarfire BBQ,” Harris said. While Sugarfire is a tasty example of transit-oriented development, it’s not the only restaurant that’s serving up great eats to passengers. In St. Louis County, award-winning Vietnamese and Chinese restaurant Mai Lee is just a few yards from the Brentwood I-64 MetroLink Station. The area around the station is often thought of as car-oriented, because of the large, big-box shopping complexes surrounding it. However, this retail cluster is easily accessible by Metro – just a short walk from the station and an even shorter walk for MetroBus riders. Mai Lee has been on St. Louis’ lists of top restaurants for many years, offering up incredible authentic Vietnamese and Chinese fare such as noodles, soups and stir fries. Finally, we can’t talk transit-oriented restaurants without mentioning the St. Louis classic that has outdone even Chicago for deep dish pizza with locations throughout St. Louis, Washington D.C., and Cincinnati. All of the Pi Pizzeria restaurants located in St. Louis are near MetroLink stations –one in the Mercantile Exchange by the Convention Center Station, one on McPherson just up Euclid from the Central West End Station, and one on Delmar just down the street from the Delmar Loop Station. If you’re sensing a pattern here, it’s no accident. Chris Sommers, co-founder and owner of Pi Pizzeria, said being near transit played a significant role in his restaurant placement. Sommers recently opened a sister restaurant, ‘ZZA Pizza + Salad, near the Skinker MetroLink Station. Sommers understands the natural progression a city takes when city streets become denser with shops and restaurants. In most cases, parking becomes a premium.